Future Events - International Cranial Association - Cranial Osteopathy, Cranio-sacral Therapy, and Cranial Therapy in the UK. 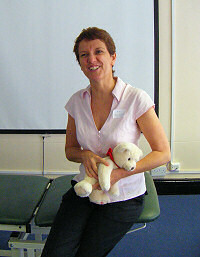 The course presenter is Claudia Knox. Claudia has been a practising osteopath for over 14 years. She was a midwife in Germany before that. Her passion for seeing health thrive in the people she cares for has motivated her continue developing as a therapist. She has trained in traditional Chinese medicine while she worked as midwife. Studying osteopathy was the next step in the journey of providing holistic care for women during pregnancy and in preparation for childbirth. Observing that good births were followed by a happy time post-partum for the mother and the child, led Claudia to become an osteopath full time. Since qualifying she has been involved in osteopathic education. Her completion of post graduate awards in paediatrics (MSc), women's health (PGD WHO) and paedagogics (PGC ACE) are enhancing her teaching. Her home college is the European School of Osteopathy in the UK but she has taught in most countries in Europe and Hong Kong, Japan and New Zealand. Her favourite topics are Paediatrics and Women's health, Clinical Integration and techniques as taught by William Sutherland. Claudia is passionate about osteopathic education and spreading the knowledge of osteopathic principles. In this one day course we want to explore what determines how the fluids are distributed in the body and how we can have a therapeutic influence on conditions that occur when the fluids suffer stasis. Health prevails where fluid exchange between all body tissues is free and uninterrupted. Cellular, circulatory and neurological models will be discussed and applied in practical treatment concepts. If you would prefer to book and pay via post or email, click here to download the booking form (135Kb .doc). Booking an event indicates you agree with our Terms and Conditions.